Agile storage solutions that are simple and easy to use. Customizable with any interchangeable combination of storage tray depths, enabling these systems to respond to individual needs and requirements for specific tasks at specific points in time. Both front and rear are fully welded and equipped with 1" square, 16-gauge steel tube frames with baked-on epoxy finish. The top panels are constructed from 18-gauge steel sheets. Lockable rubber castors can support over 400 lbs. per cart. 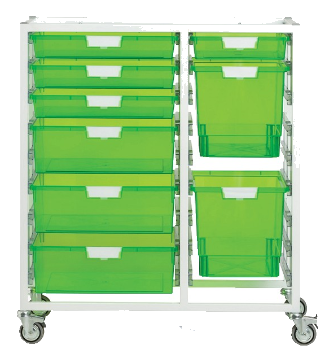 Choice of carts that are built for slim bins, wide bins, or a mix of both.